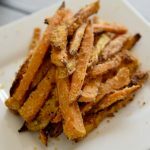 I finally decided to try out some Air Fryer Sweet Potato Fries. Made in my new Ninja Foodi, I coated them with Panko, Garlic, Onion and Chili Powder. They turned out fantastic. Check out the recipe below! LOOKING FOR MORE AIR FRYER RECIPES? CHECK OUT MY AIR FRYER POTATO WEDGES OR MY HONEY SRIRACHA AIR FRIED CHICKEN WINGS! My wife actually turned me on to Sweet Potato Fries years ago. 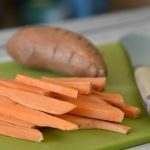 I had always thought of Sweet Potatoes as one of those things you might encounter on your Thanksgiving Plate. It had never occurred to me that A: you could make french fries wtih them and B: they would be so fantastic. So, for years, we have been buying frozen Sweet Potato Fries to cook in our oven and have been pretty happy with them. They honestly weren’t quite as good as the restaurant version, but that was ok. On occasion, we had also tried to make our own version of Sweet Potato Fries, with varying degrees of success. Then, about a year ago, I was introduced to the Air Fryer. Since then, I’ve been Air Frying just about everything, from Chicken Wings and Onion Rings to Kale Chips, Potato Skins and French Toast. I’ve been on an Air Frying mission. What is an Air Fryer? It is a small electrical kitchen appliance that can fit easily on your kitchen counter. An Air Fryer works using “rapid air technology” to cook your food. This is quickly moving hot air that, paired with the metal basket that most of them use, gives your food a crispy outside and an evenly cooked inside. So, you can get that “fried food” result using very little (or no) oil at all! The bottom line is your dish with be healthier, with less saturated fat, than traditional deep frying. I got my first Air Fryer about a year ago and have loved it. But recently, we have just gotten a Ninja Foodi. This is an appliance that can do just about anything. It is a pressure cooker, much like the Instant Pot, but it can also “tender crisp” your food just like an Air Fryer. It can also steam, slow cook, broil and dehydrate your dish. Pretty cool stuff. This was actually the first time I’ve used my Ninja Foodi, so I wasn’t sure what to expect. But, whether you are using the Ninja Foodi or another Air Fryer, you have got to try this new way of cooking. 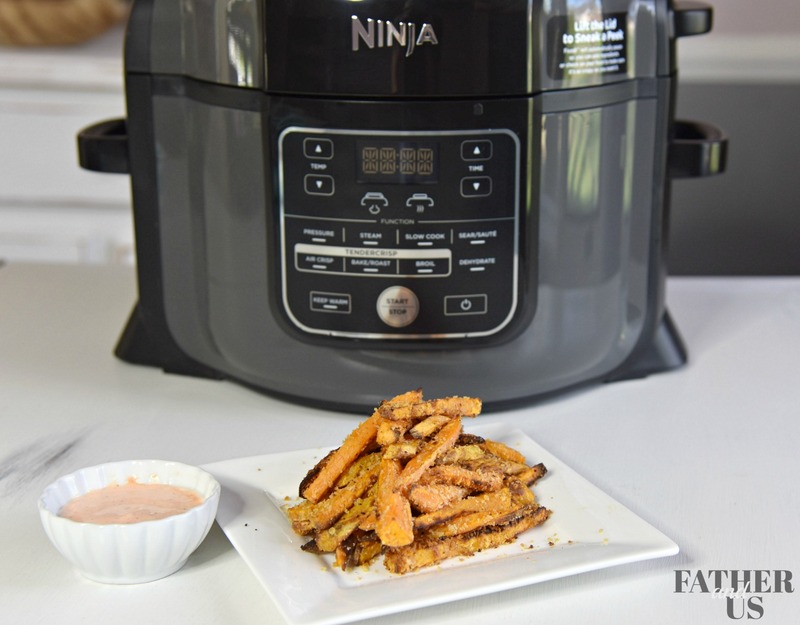 It wasn’t until recently that it had occurred to me to learn how to make Sweet Potato Fries in an Air Fryer. It turns out that it’s pretty darned easy. 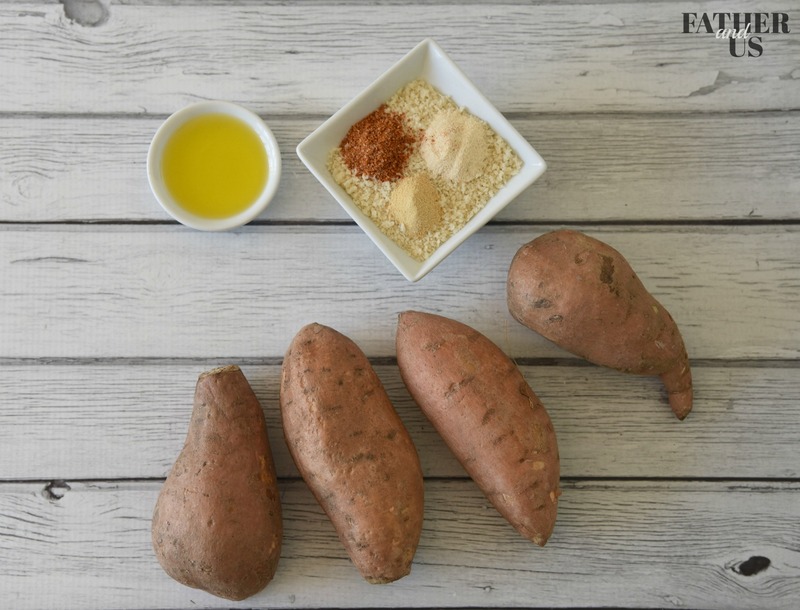 All you need is a few simple ingredients, most of which you probably already have in your kitchen. My secret ingredient for this recipe is Panko Bread Crumbs. 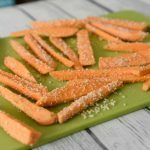 The use of Panko Bread Crumbs is one thing that I’ve been using on a lot of my Air Fryer Recipes. I’ve found that coating my recipes with Panko really gives the end result a wonderful feel and texture. 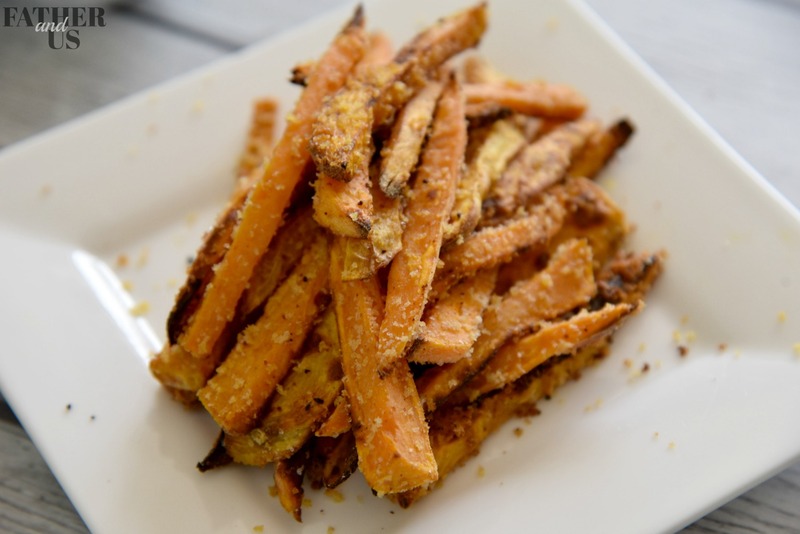 So, I thought I’d try Panko Crusted Air Fryer Sweet Potato Fries! One note here is that I did use a teaspoon of chili powder in my breading because I like a little heat in just about everything I make. But, you can omit this ingredient if you wish. Honestly, it didn’t add much heat at all, it just gave the flavor a little more dynamics. 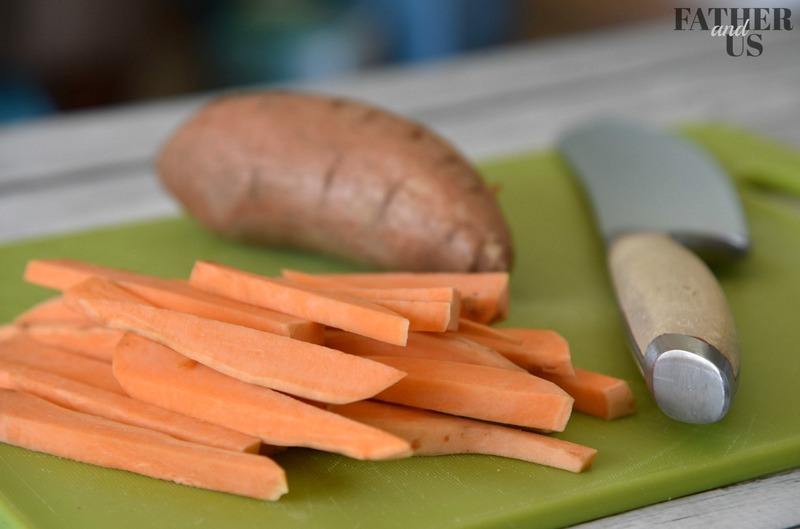 Another useful trick I found for this recipe: make sure you cut the sweet potato up into pretty thin “fries”. This will help ensure they come out nice and crispy. Mix together all the dry ingredients: panko, garlic powder, chili powder and onion powder. Lightly coat the fries with the dry ingredients. This should be a LIGHT coating. The coating on the outside was just bursting with flavor. They were completely addicting. I shared these with my wife. When there was only one left on the plate, she looked at me in an apologetic way and took it without saying anything. Then she just walked away. That is not like her at all. But the power of these Sweet Potato Fries in the Air Fryer cannot be denied. I made some Sriracha Ranch dressing to dip them in and it was a perfect pairing. It is easy to make, just mix some ranch and Sriracha together in a dish at a about a 1:5 ratio. 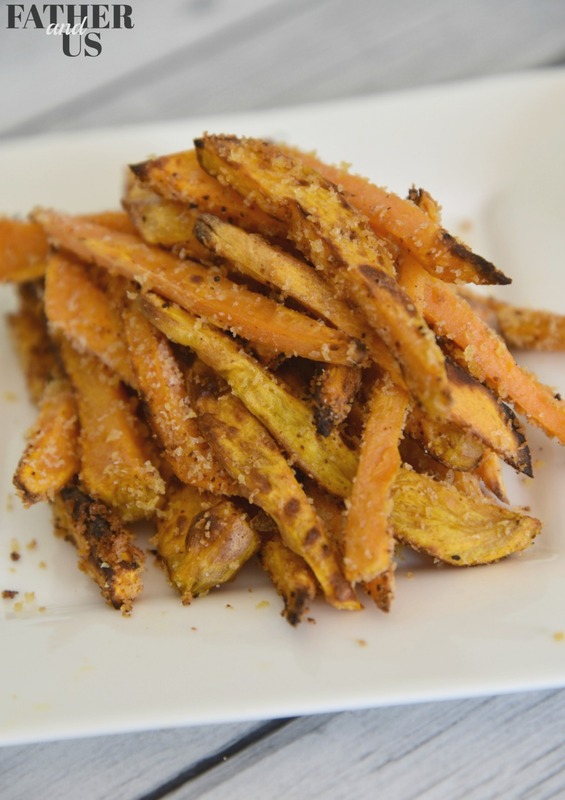 It is the perfect compliment to these Sweet Potato Fries made in my Air Fryer. 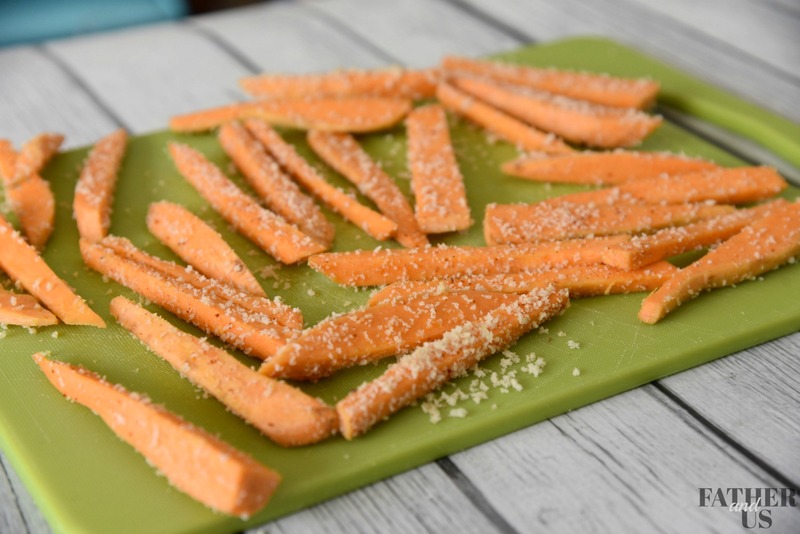 These, quick and easy Air Fryer Sweet Potato Fries are with Panko Bread Crumbs to give them a nice crisp on the outside. Salt, Garlic and Onion Power round out the flavor and they will be your new favor Air Fryer Recipe. 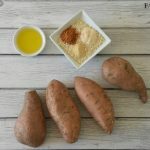 Cut Sweet Potato into thin "fries"